Elliot Group have announced that they have submitted a Planning Application to the City Council for the removal of the Piazza ‘Bucket’ Fountain from Beetham Plaza and re-locating it to an as yet undisclosed location (at their expense) so that they can build a much-needed boutique hotel on the public open space of the Plaza. They are currently in discussions with the city council about re-siting and places suggested so far include Williamson Square and the Strand. Of course it will be obvious to everyone that we wouldn’t even be considering removal of the fountain if a developer didn’t want to build a hotel on the site of one of the smallest public open spaces in the city centre. We all know that there are plenty of locations in the city centre where there are still post-WWII surface car parks that would look much better with a hotel on them. Could anyone imagine a developer suggesting the relocation of the Queen Victoria monument in Derby Square to build a hotel or the magnificent sculpture at the centre of Exchange Flags or getting rid of all the tables and chairs in Concert Square for another hotel? There would rightly be a huge public outcry. Beetham Plaza and its fabulous fountain should be no different. Mayor Joe Anderson is very supportive of the plans and he said to one of the Friends of the Piazza Fountain, Friday 12th October just after 2.00pm as he was leaving a meeting of the Combined Authority on the 1st Floor of No 1 Mann Island, that he is ‘all in favour of moving the fountain to a better location so that more people can see it, it’s hidden away’. Its really good that the Mayor wants to get more people to see and enjoy the heritage of the city but this particular piece of art in the UNESCO World Heritage Site and the Castle Street Conservation Area is sited there for a very important reason – it’s a sound sculpture and to be fully effective it needs the close proximity of the surrounding buildings so that the cascading waters can reverberate around the Plaza and re-create the sound of the sea crashing onto the African coast from where millions of slaves were transported into captivity from Goree in Senegal on ships that sailed from Liverpool. This fountain evokes this and there is a plaque in the shape of an African shield at the base of one of the viewing platforms that references the Goree (see below). What the Mayor and the developer have failed to understand is that the bucket fountain isn’t just any old fountain it is designed around the sound the water makes as it tumbles from each of the buckets/hoppers and we must ensure that it remains in an enclosed space where the echos and reverberations of the tumbling waters create in the minds and emotions of the listeners/visitors the possibility of journeying to another place where we can engage the collective memory around our connections with the slave trade and the continuing impact this is having on the lives of black people who are descendants of those transported and trafficked African peoples. The siting of this sound sculpture close to the Mersey as it is and very close to the site of the former Goree Piazza makes this connection even more poignant. The other issue that frankly astounds most people who come to hear of these proposals is the sheer audacity to suggest it is appropriate to want to lose this public open space and build a hotel on it (badly needed as some of the developer’s friends consider it is). Citizens will rightly want to fight to protect this small and peaceful public open space from becoming the foundations of another building that will inevitably put all those people who live facing the plaza and the fountain literally in the shade. We hear people saying often that this could only be happening in Liverpool – no other city would allow such a proposal to come forward and any developer would have been told during pre-planning discussions that it was not a good idea and would be opposed by the city. But not in Liverpool at present. With the Mayor on board no-one in the Planning Department is going to suggest it shouldn’t come forward for consideration. And so ordinary people, residents and visitors alike, find they have yet another fight on their hands to protect yet another piece of public open space against developers and their powerful supporters. Do you care enough to help these people protect this space and the fountain at its heart so that you, your children and future generations can find this hidden gem and enjoy the magic of this delightful sound sculpture for years to come? Join the Friends of the Piazza Fountain through Facebook and Twitter and sign the Petition on Change.org today. Keep in touch with us so we can keep in touch with you and let you know of the events that will be organised in our campaign to preserve this fountain and plaza for generations to come. 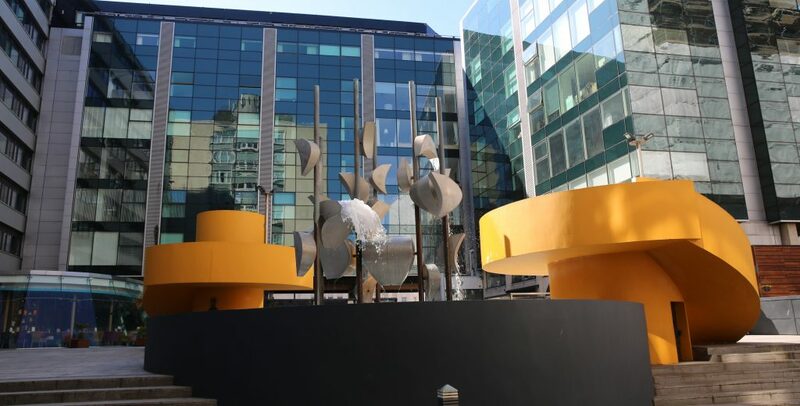 There is an earlier article about the fountain HERE on the Engage website 18.02.19.